The flowers of chamomile contain 1–2% volatile oils including alpha-bisabolol, alpha-bisabolol oxides A & B, and matricin (usually converted to chamazulene). Other active constituents include the flavonoids apigenin, luteolin, and quercetin. Chamomile Flowers - capsule: Vegetable hypromellose (HPMC). 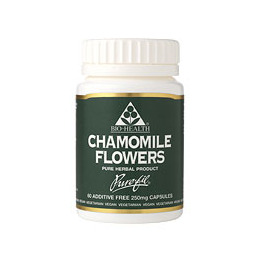 Below are reviews of Chamomile Flowers - 60 x 250mg - Best before date is 31st May 2019 by bodykind customers. If you have tried this product we'd love to hear what you think so please leave a review. Useful if you suffer from insomnia, I take it along with Melissa, they work well together. A very good product. The flowers of chamomile contain volatile oils including alpha-bisabolol, alpha-bisabolol oxides, and matricin. Other active constituents include the flavonoids apigenin, luteolin, and quercetin.